This comfy lightweight jacket does up with snaps, and looks well worn. In bright light, it can actually look like quite a vibrant blue, most of the time though, it looks nearly black. In Nightmare (1x14), you can actually see that it has a little stripe of red inside the cuffs. Brand Information: This jacket has been identified as a discontinued model of jacket by an obscure brand called Windriver. It’s first appearance is in Skin (1x06), Dean wears it from the beginning of the episode until the shapeshifter steals it (except he briefly has it off while they review the security tape at Becky’s house). In Hookman (1x07), Dean wears it from the morning he gets Sam from the police station until the end of the episode, only taking it off when he digs up and burns the bones and when he is researching at the library. In Scarecrow (1x11), Dean wears it to see Emily off at the bus station at the very end of the episode. In Nightmare (1x14), Dean wears it for almost the entire episode, he is only without it in the motel scenes, or when he is wearing a priest outfit. 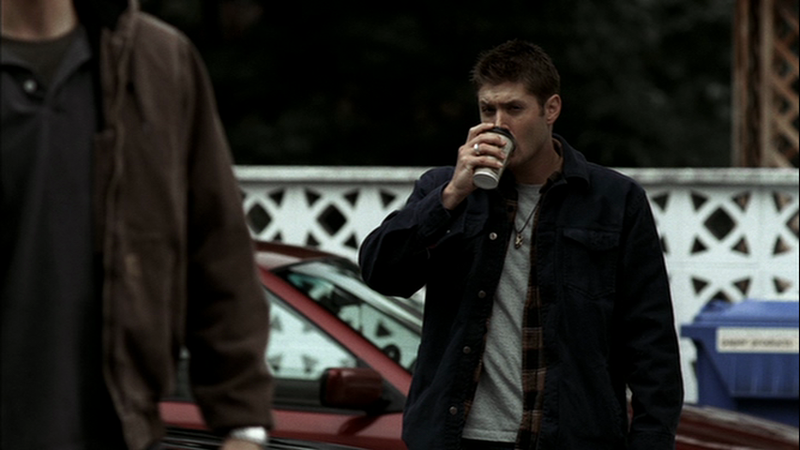 In Provenance (1x19), Dean wears it from the beginning of the episode when he and Sam are at the bar, until they check into their motel (this includes their first visit to the auction house). 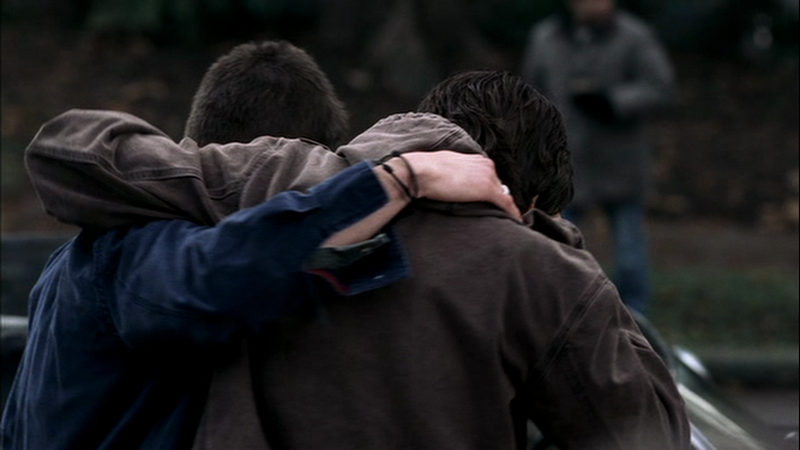 In Simon Said (2x05), Dean wears it after he changes out of his suit after he and Sam track down Andy. He keeps it on for the rest of his time in Guthrie, OK. (He does not wear it for the final scene at the Roadhouse). In Folsom Prison Blues (2x19), Dean puts it on after they escape from prison. He takes it off momentarily while they dig up the grave. In The Magnificent Seven (3x01), Dean wears it for the entire episode...except of course, the very first scene, in which we only see him in a white-undershirt and then Sam presumably sees him completely naked. 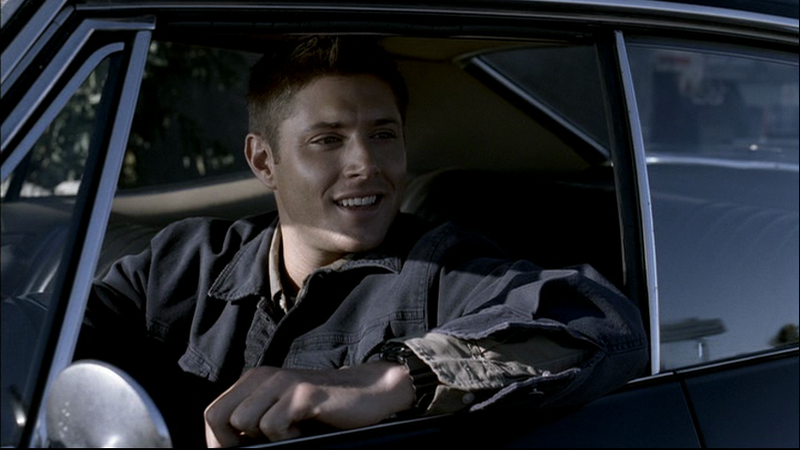 In Red Sky At Morning (3x06), Dean wears it at the very end of the episode when he and Sam talk in the car. In Malleus Maleficarum (3x09), Dean wears it for the final scene with Ruby. 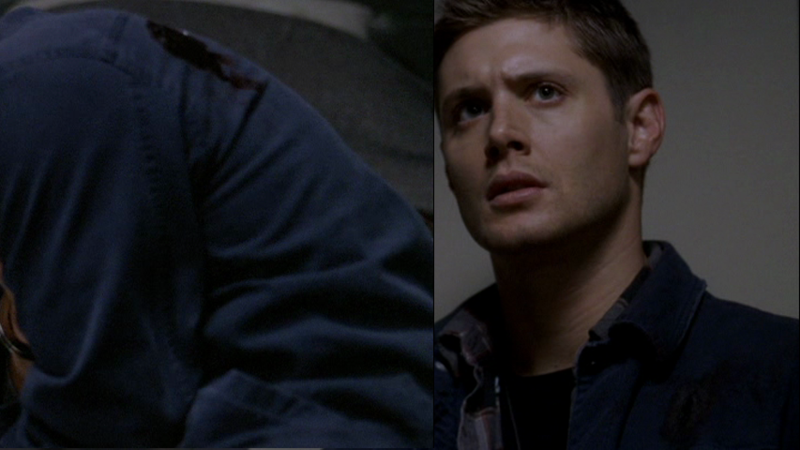 In Jus In Bello (3x12), Dean wears it from the beginning of the episode until they leave the police station. He takes it off briefly after he is shot and Nancy is patching up the wound. It makes it’s triumphant return two seasons later in The End (5x04), when 2009!Dean wears it for the entire episode, except when is inside his hotel room at the beginning. In Changing Channels (5x08), Dean wears it during the opening theme song when we see him working on the Impala. In The Real Ghostbusters (5x09), Dean wears at the end of the episode when he says goodbye to the new friends he made at the convention. In Two Minutes to Midnight (5x21), Dean wears it at the end of the episode when he and Bobby discuss Sam’s plan to say yes to Lucifer. In Two and a Half Men (6x02), Dean wears this coat at the very end of the episode, when he takes the cover off the Impala. In Live Free or Twi-Hard (6x05), Dean puts on this coat after telling Sam and Samuel about the vampire vision while they are packing up at the end of the episode. He keeps it on for the final scene in the parking lot. In Clap Hands If You Believe (6x09), Dean wears this coast at the very end of the episode, while he enjoys a beer on the hood of the Impala. 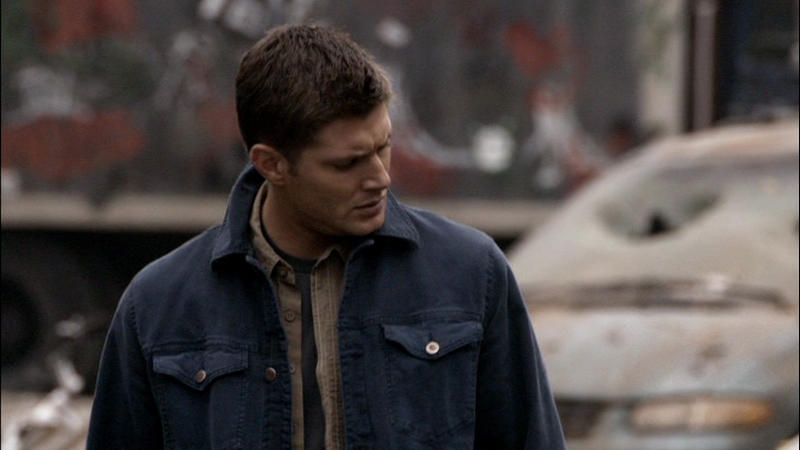 In Like A Virgin (6x12), Dean wears this coat for the scene between him and Sam in Bobby’s scrapyard, when he attempts to convince Sam that what Sam did while he was soulless was not his fault. In The Man Who Would Be King (6x20), we see that Dean wore this shirt while raking leaves at Lisa’s house, during his year there. In The Girl Next Door (7x03), Dean wears this coat when he goes looking for the wayward Sam. He wears it for the rest of the episode, only taking it off briefly when he wears a suit to talk to the coroner and then again when he’s inside Sam’s motel room. In The Mentalists (7x07), Dean wears this coat at the end of the episode when he and Sam talk in the cafe, Dean bids farewell to Melanie, and they hit the road together again. In Season 7, Time for a Wedding (7x08), Dean wears this coat at the end of the episode as Sam signs the annulment and the boys bid farewell to Garth. In Adventures in Babysitting (7x11), Dean wears this coat at the end of the episode when he tries to convince Crissy’s father to quit hunting and then he says goodbye to Crissy. In Slumber Party (9x04), Dean enters wearing this jacket at the very beginning of the episode, and then takes it off as he updates Sam on how Kevin is doing on his little vacation in Branson. In Blade Runners (9x16), Dean wears this coat when he and Sam go to fetch Crowley from his hotel and when they go to track down Cuthbert Sinclair (Magnus) and find the First Blade. Hey! Working on a clip challenge again! You have 6.11 down as Like a Virgin here, but it is Appointment in Samarra. 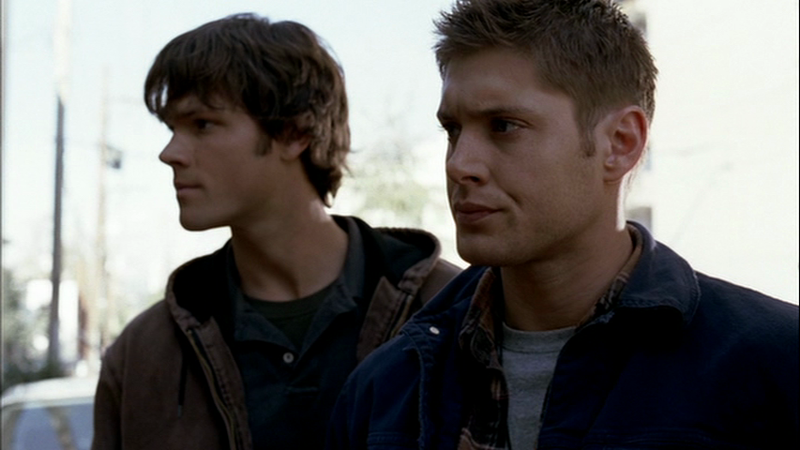 Hmm... Like a Virgin ends with Sam and Dean in Bobby's office. There is a scene outside between Sam and Dean before this when Dean is checking the hord of gold he got from the dragons(in the garage?) 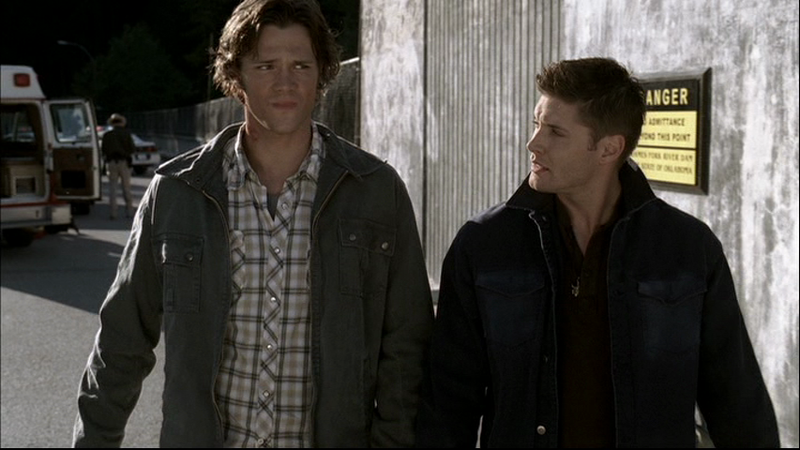 and Sam comes to talk about what happened with his soul. Okay, it's the second to last scene of 6.12. I'll fix that.